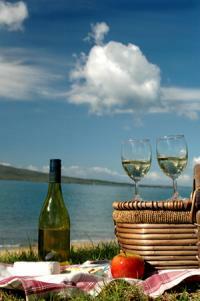 Discover the best picnic wines this summer season. The weather is perfect and the location is set: the perfect tree sitting in a nice meadow-perhaps on top of a hill-with lush green grass underneath. Not too hot and not too cold-in a word, perfect. This is a picnic spot of champions. Of course, we can't all have the wonderful hidden away spot, but we still want to have picnics! Perhaps it's at your local park, lake, front lawn or even backyard. Picnics are all about the food, company, and of course, the perfect wine to pair with all of that. We talked about barbecue wines before, but picnic wines are different. Barbecues are also another summer "must do" activity, but the style of flavor in barbecue calls for a different type of wine than foods prepared for picnics. Barbecue is all about bold and spicy, while picnics are more broad and lighter fare. Think about all the famous picnic foods and you'll quickly realize that: 1) most of the foods are cold and 2) most of the food is on the lighter side. Remember all of your favorite picnic foods? Potato salad, cold fried chicken, cheeses and crackers, some lunch meats and fresh bread, ripe fruit in season, etc. Lots of variety. So what are the best picnic wines? Well, I would strongly recommend that you think cool, crisp, and white/rosé or very light red. Let's talk about white wines that pair with picnic fare first. Picnic fare is all about the variety, ease, and "travel ability". The food has to survive the time it takes to get to the picnic area, handle not being too cold for a long period of time (unless you want to lug around a cooler) and not be too messy. These tend to be foods that are lighter: the cold fried chicken, veggie trays, lunch meats, and fruit. Crisp, delicious white wines are a must in these situations! You can buy those freezer sleeves that can slide over bottles to keep them cool so you don't have to worry about carrying too much ice with you. I think Sauvignon Blanc and crisp wines like it are a good choice. Chenin Blanc, Pinot Gris, and Pinot Blanc are among my favorite varietals too. They are bright, acidic, and loaded with crisp citrus fruit and minerality. Lighter white wines like this make the food come to life while refreshing your palate. Rosé wines are among my all-time favorite summertime quaffers. They are so versatile that they are a must-pack with your picnics. They are served chilled, just like white wines, so slide a freezer sleeve over this wine, too. It's also acidic, but the red wine it's made from offers a little more melon/strawberry/red fruit qualities that pair well with many food types. The nice thing about rosé? Cheap! You can pick up some really good ones for under $10 easily (and I'm not talking white zinfandel, either). What do I mean by light red wines? Just that…you don't want to pack your 16% alcohol zinfandel in your picnic because it will overpower any of the foods you bring. So you need to find something that isn't heavy or brooding, but lighter and with less alcohol. What fits that bill? Pinot Noir, Gamay, Beaujolais, and some "table red wines." What I mean by table red wines is that some wineries will put together a red blend wine that is simple, lighter, and inexpensive. They will give it some name (usually a clever, funny name) and will call it "red table wine" and have it priced pretty reasonably ($9-$14). You have to pick up the bottle and read it…sometimes they tell you that it's a great picnic wine straight out, or they may say it's a blend of red grapes that is blended just to make a simple red wine. So these are perfect wines too, especially for the non white wine drinkers out there. Hanna Winery, Sauvignon Blanc-$9.99 This wine is a perfect example of this grape at its purest. Tart lemon, lemongrass, and mineral shoot out of the glass. This one is in my refrigerator all summer long, ready to be packed on a picnic at moment's notice. Dry Creek Vineyards, Chenin Blanc-$9.99 Chenin Blanc is not a well-known grape to many American wine drinkers. It's like a Sauvignon Blanc, but with a little more melon and lighter citrus notes. This one is a great buy, and an easy summer day quaff. Notes of pear and tropical fruit show through in the palate, too. Robert Sinskey Vineyards, Rosé of Pinot Noir-$15.00 This is a stellar effort from one of the best producers of rosé in Napa Valley. Using Pinot Noir from their vineyards, they produce this light-bodied, yet full flavored pink wine! 100% dry, notes of orange peel and bergamot always amaze me when I sip this. Watermelon notes with a hint of spice really shines through too-an absolute delight. Iron Horse Vineyards, Rosato of Sangiovese-$8.99 Iron Horse Vineyards is famous for its sparkling wines, but their still wine program is nothing to shake a stick at. This rosato (Italian for rosé) is a bigger-styled wine because of the Sangiovese grape used. Notes of red apple, luscious strawberry and citrus peel really give this wine a unique appeal. Rochioli Vineyards, Gamay-$16.00 Rochioli has a seven year wait list to get on their single vineyard pinot noir purchase list. But their more widely produced wines are among my all-time favorites. This Gamay (grapes grown in the Burgundy area of France, among others) is a lighter red wine. It shows notes of steely minerality and earthy, tangy fruit. Notes of black cherry and raspberry with a touch of dust thrown in. You have to taste this to believe it, but you also have to buy it in their tasting room. At this price, it's worth the effort. Forestville, Pinot Noir-$3.99 You read that right…$3.99. And don't dismiss this wine because it's cheap! This wine is not a stunning example of Pinot Noir by any means, but it's light, consistent, simple, and most importantly, sound. It's an easy-going and easy to find wine. Cherry, strawberry, and a little cola shows through. On the palate it's not heavy and won't overpower your picnic food. So enjoy the next picnic you're on with friends and family. Pack your favorite foods with the confidence of knowing you have many wine choices to pack along as well. Enjoy!